The clock is ticking extremely fast, with only 13 months or so left for reaching a Brexit agreement with our EU partners. Strange as it might sound, it is the Labour party, rather than the Government, who is now calling the shots. Indeed, Jeremy Corbyn’s announcement that Labour favours a Customs Union with the EU has the potential to create political momentum towards a Labour majority, that is not currently reflected in the polls. Contrast this with how Brexiteer policymakers are dealing with Brexit issues. Foreign minister Boris Johnson responded immediately to Corbyn’s talk by calling him “cynical and deluded”. Yet, Johnson’s most recent talk on Brexit issues failed to offer any real clues as to what type of ‘workable’ relationship with the EU the government is favouring. By venturing “some innuendo about tourists in Thailand”, Johnson’s speech instead came across as a trick to evade press conference questions. A tactic like this is, to some extent, understandable as the government remains split on what its future Britain-EU vision is going to be; despite the most admirable efforts of Theresa May to ‘force’ some type of agreement at Chequers. Yet, Mr Johnson’s speech was so rich in rhetoric that it would have made Sicilian pre-Socratic rhetorician Gorgias the “Nihilist” jealous. Not least because Johnson followed Gorgias’s most famous work, On the Non-Existent. In that very work, Gorgias put forward three arguments: that nothing exists; that, even if something did in fact exist, it could not be properly known; and that, even it could be properly known, it could not be communicated through language. Indeed, what we really learnt from Johnson’s speech is that a proper Brexit plan does not exist; that even if it did exist, it could not be properly known because all studies assessing this or alternative Brexit plans are not in the public domain; and that, even if a Brexit plan was properly known, it could definitely not be effectively communicated either to the public or to the EU’s top negotiator Michel Barnier through the tactics often used by our top Brexiter policymaker, Boris Johnson. Indeed, government stubbornly refuses to publish details of its estimates on how our economy will be affected by different trade deals with the EU. That said, the National Institute of Economic and Social Research comes to our rescue by explaining in detail that a continued membership of the European Economic Area scenario will hit our economy less than every other deal. Although that study is indeed very helpful, our business community are still desperately looking for formal Economic Policy ‘clues’ to base their investment decisions, and keep the economy going. Figure 1 makes this point forcefully. 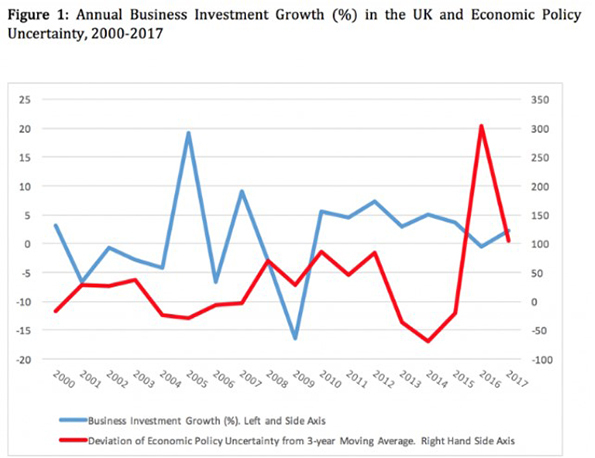 It is clear there is an inverse relationship between annual business investment growth and economic policy uncertainty in the UK. We measure the latter by focussing on newspaper articles from The Times and The Financial Times that discuss economic policy uncertainty. Following from the 2016 referendum result and the uncertainty it triggered, business investment in the UK recorded its first annual drop of 0.5% for more than half a decade. Nevertheless, recent efforts by Ms May to clarify Brexit related issues through her Florence talk in September 2017 paved the way for some initial agreement between Britain and the EU to move forward with their talks. All this helped our Business investments to recover by returning to a 2.1% growth in 2017. What the graph is also telling us is that the ball is in Ms May’s court to push forward with a meaningful proposal which will provide additional clarity so that our business leaders can continue investing. Despite being praised by business leaders, Corbyn’s announcement in favour of a Customs Union does not form government policy. 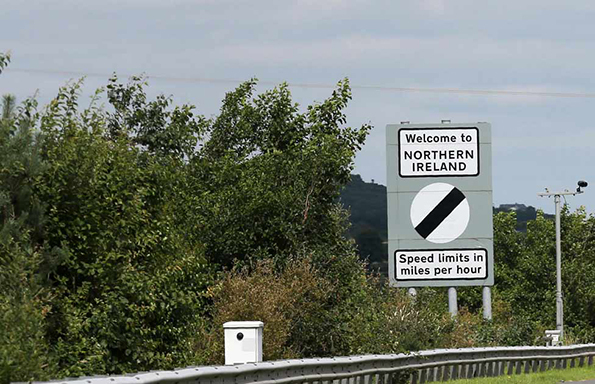 All this makes May’s forthcoming talk on 2 March extremely important, especially now that EU’s fallback plan is to keep Northern Ireland in the Customs Union. The PM has to commit to what Corbyn just announced so that we get on with Brexit negotiations without any more unnecessary distractions. Doing so will put the economy first, even if this occurs at the increasing risk of splitting her own party.